PARIS, France, August 18, 2015 (ENS) – The Renault-Nissan Alliance will provide a fleet of 200 electric vehicles for the United Nations climate summit in Paris in December. It will be the first time the UN uses a zero-emission fleet to meet its entire passenger car needs at a Conference of the Parties event. The electric car fleet will transport delegates during the event at Paris-Le Bourget from November 30 to December 11. There, world leaders are expected to sign a universal, legally-binding pact to lower greenhouse gas emissions enough to hold the increase in the planetary temperature below 2 degrees Celsius, relative to pre-industrial levels. In addition, the UN aims to have the Climate Green Fund begin allocating funds. This new multi-billion dollar fund was established to help developing countries adapt to climate change and reduce emissions. More than 20,000 UN participants from 195 countries are expected to attend the climate summit. The COP21 car fleet will feature the Renault ZOE subcompact car, the Renault Kangoo Z.E. zero emissions van, the Renault Fluence Z.E. zero emissions sedan, the Nissan LEAF compact car and the seven-seater Nissan e-NV200 van. The vehicles will be available 24/7 to shuttle delegates to key venues around the conference, as a complement to public transportation. The partnership agreement between the Renault-Nissan Alliance and the General Secretary in charge of the preparation and organization of the 21st annual Conference of Parties to the UN Framework Convention on Climate Change, or COP21, was signed in May. 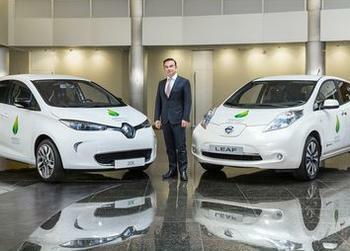 “We are delighted to announce that the Renault-Nissan Alliance is an official partner of COP21 in Paris. The Alliance’s fleet of 100 percent electric vehicles will contribute to our goal of achieving a carbon neutral event,” said the President of COP21, Laurent Fabius, France’s minister of foreign affairs and international development. “The technology of electric vehicles helps reduce greenhouse gases in the transportation sector efficiently,” he said. “Electric vehicle technology is an efficient solution for a practical and affordable mode of transportation. This solution has a positive impact on the climate and air quality in our cities,” said Carlos Ghosn, chairman and CEO of the Renault-Nissan Alliance. “It’s time to accelerate the shift to zero-emission mobility by working together with all parties concerned,” Ghosn declared. The Renault-Nissan Alliance will work with companies in France to set up a network of more than 50 quick and standard charging stations powered by 100 percent renewable energy in strategic locations. The quick charging stations will be able to charge the COP21 electric vehicles from zero to 80 percent capacity in about half an hour. The Renault Nissan Alliance will also participate in Solutions COP21, an international exhibition on climate-change solutions, at the Grand Palais in Paris. The exhibition, which will take place December 4-10, will feature climate solutions from cities, businesses and other organizations around the world. In addition to an EV display at Solutions COP21, the Alliance will have at least 10 EVs available for the public to test drive. The Renault-Nissan Alliance is the only automaker with a full range of 100 percent electric vehicles. The Alliance has sold more than 238,000 EVs globally since December 2010, when the Alliance’s first electric vehicle – the Nissan LEAF – went on sale. The Alliance sells about half of all electric vehicles sold worldwide. PHOTO: Carlos Ghosn, chairman and CEO of the Renault-Nissan Alliance with the Renault Zoe and the Nissan LEAF identical to those that will be available to delegates at COP21.